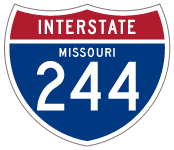 Interstate 244 was the former designation for the 20-mile section of Interstate 270 (Circumferential Expressway) between Interstates 44 and 70. Designated in 1958 and completed in 1967,1 I-244 was renumbered as Interstate 270 in 1974 due to motorist confusion.2 AASHTO approved both the renumbering of I-244, and I-255 east from Mehlville into Illinois as I-270 on June 25, 1974. Interstate 270 constitutes a busy commuter freeway through the St. Louis County suburbs south from I-70 at Bridgeton to Des Peres and Sunset Hills. Original construction of the Circumferential Expressway opened up vast tracts of land for suburban development. Photo taken 10/16/04. Exits 20A/B leave Interstate 270 south for I-70 from within the diamond interchange (Exit 20C) joining the beltway with Missouri 180 (St. Charles Rock Road). I-270 transitioned to Interstate 244 south just ahead. Photo taken 10/16/04. Single lane ramps separate from Exit 20 for Interstate 70 west to the St. Charles County suburbs and east back to St. Louis Lambert International Airport (STL). Photo taken 10/16/04. Interstate 70 travels through the city of Bridgeton to the turbine interchange (Exit 232) with I-270. When Interstate 244 ended here, the exchange consisted of a full cloverleaf. Photo taken 10/16/04. Interstate 270 curves northeast through Bridgeton to Hazelwood and Florissant. The north-souh stretch extends from I-70 and Champ along former I-244 to Creve Coeur, Kirkwood and Sunset Hills. Photo taken 10/16/04. All traffic for Interstate 270 east toward Illinois and south to the I-55 corridor departs from Interstate 70 west in unison at Exit 232. Work upgraded the interchange here in the early 1980s. Photo taken 10/16/04. Interstate 244 ended where Interstates 270, 55 and 270 come together near Mehlville. See the Interstate 270 Missouri / Illinois page for photos covering the cloverstack interchange joining the three routes. “Two-Mile Stretch In St. Charles Paved Way For America’s Interstate System – Highways Shortened Drives But Weakened Cities.” St. Louis Post-Dispatch, December 14, 2003. “I-255 Rim Means Loop Is Finished – For Now.” St. Louis Post-Dispatch, July 31, 1988. “‘New’ interstate highway loop is planned for Springfield.” KY3 News, December 24, 2013. “Officials seek interstate loop around Springfield.” News-Leader (Springfield, MO), November 25, 2013.